My friend, Susan, is staying with me for a bit and she always raves about her mother's recipes. Her Mom, Sarilyn, is a great Texas cook and a Live Bake Love follower, which we love! 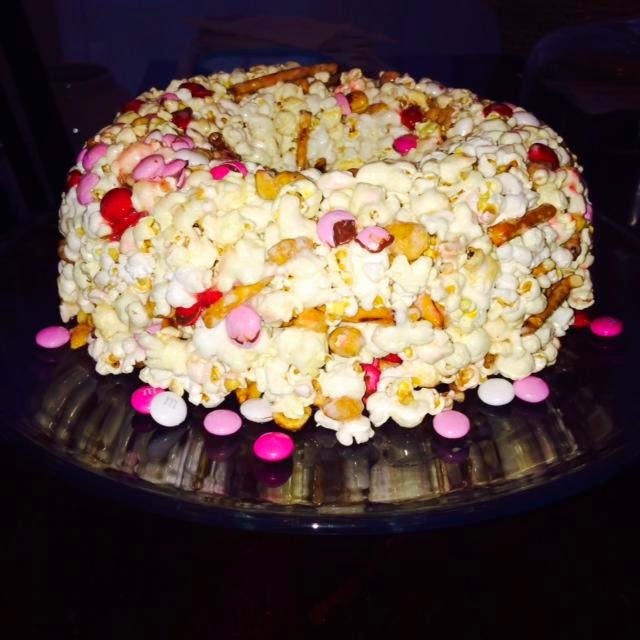 So Susan kept talking about this popcorn cake her mom used to make for them when they were young. Well, after a bit of research we found a similar recipe which her mother said was close to the one she used to make. OKAY... now I see what she was talking about. This stuff is addicting! Sweet and salty with the right amount of chocolate to satisfy any craving! 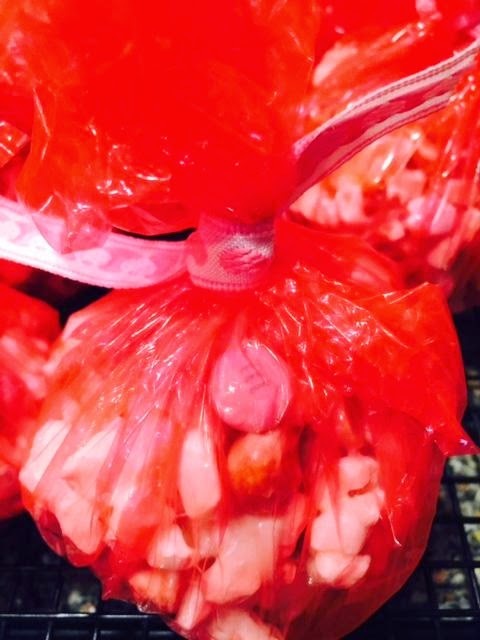 If you need a quick treat for your love this Valentine's Day, give this recipe a try. This one gets the Live Bake Love seal of approval! 1. 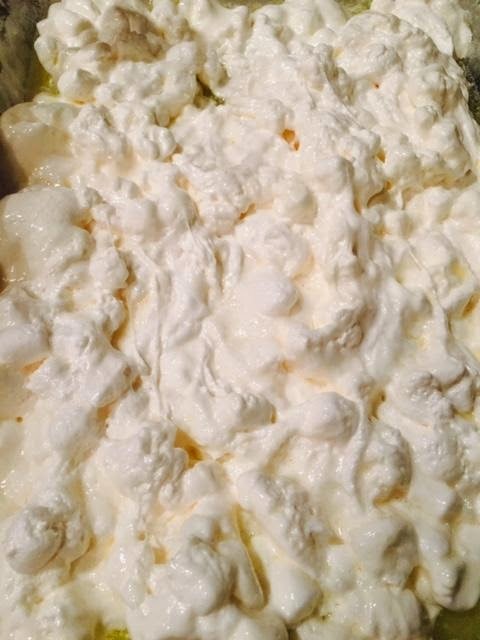 Place marshmallows and butter into a glass baking dish. 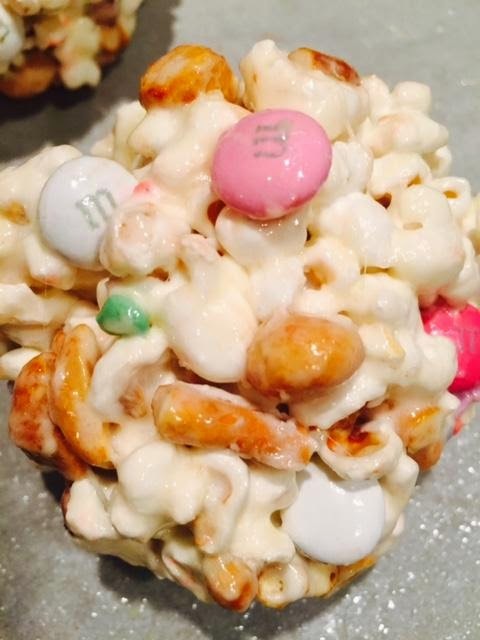 Place in the microwave and cook for 1-2 minutes until butter and marshmallows have started to melt. Stir. 2. 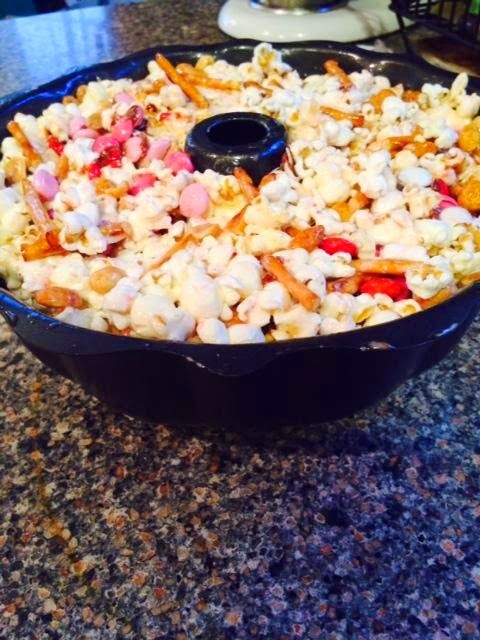 Once butter and marshmallow are melted, add popped popcorn and stir to combine then add peanuts and pretzel sticks. Stir to combine. 3. 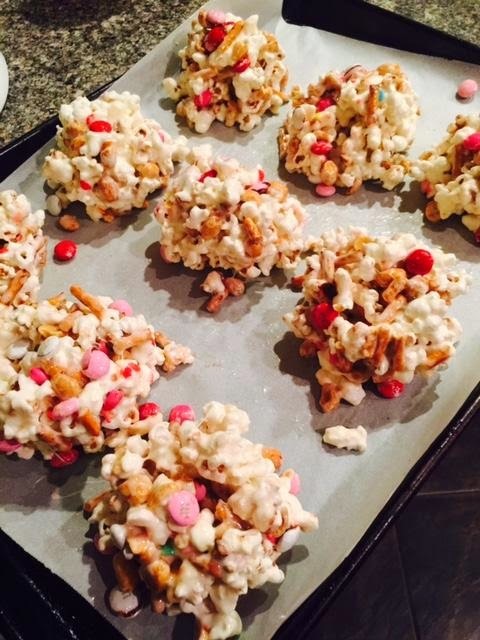 Allow to cool for about 5 minutes, then add M& Ms and sprinkles. 4. If you're making the cake, spray a bundt pan heavily with cooking spray and a place the popcorn mixture in the pan making sure to press into all the crevices of the pan. Allow to set for about 5 minutes. Once slightly hardened, carefully invert onto a plate. Allow to harden over night. 5. 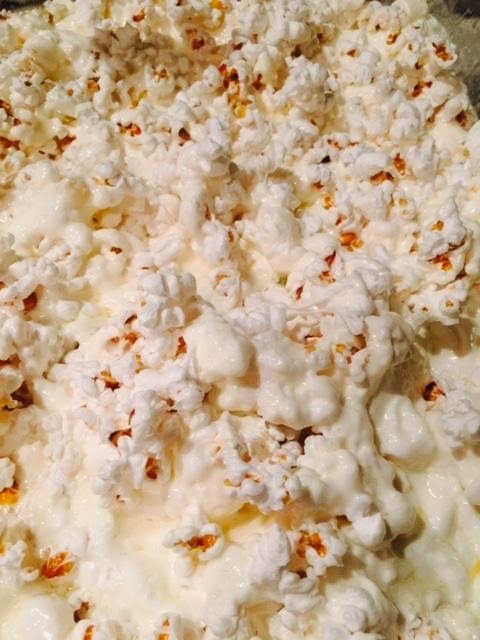 If you're making popcorn balls, spray your hands with non-stick cooking spray. Mold the mixture with your hands into baseball size balls and place on baking pan. Once all balls are done, refrigerate for about 10 minutes to set. Once set, press balls together to compress them into tighter balls. Quickly wrap in plastic wrap allow to set for a few hours or over night. Have you ever tasted something so delicious it makes you do a happy dance? 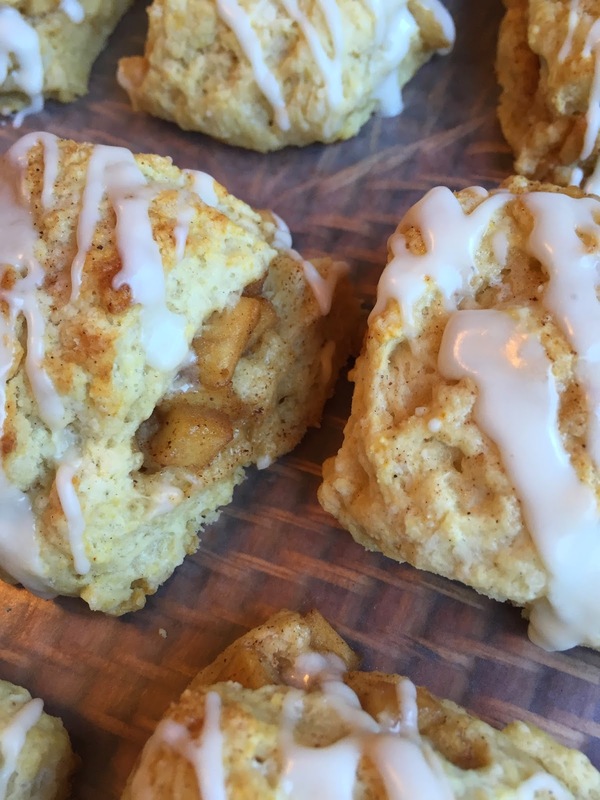 Well, I had this very reaction to these Apple Pie Scones with Vanilla Glaze. I guess you can say I wasn't expecting them to be THAT good....but they are. This recipe requires a few more steps than your average scone recipe (ie making the filling), but remember these are not your average scones. 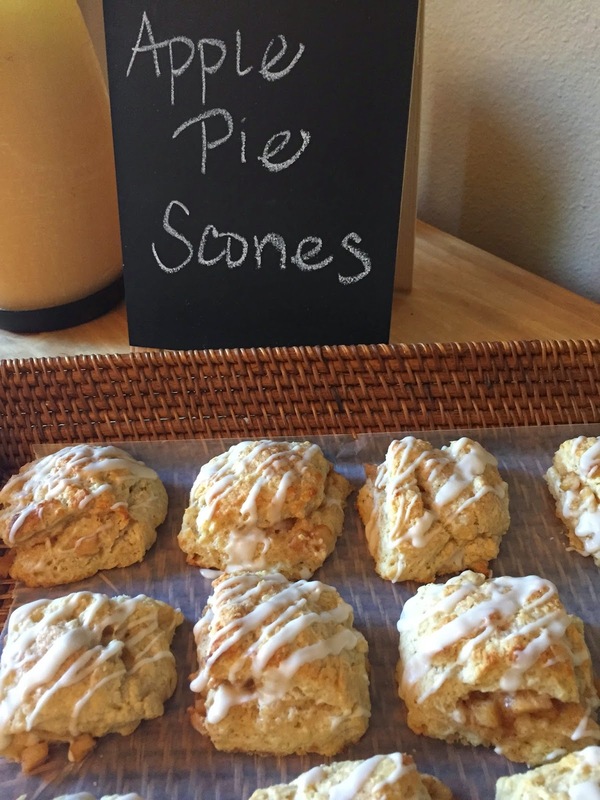 They're "happy dance" scones! In a small saucepan, combine the chopped apples, sugar and cinnamon. Cook over medium-low heat, stirring occasionally, until sugar has melted and apples start to tenderize (approx. 3-4 minutes). Remove from heat, then place on a plate in a single layer to cool completely (approx. 15 minutes). In a measuring cup, combine the 3/4 cup buttermilk, egg and vanilla. Whisk to combine then return to refrigerator to keep cold. In a large bowl, whisk together the flour, baking soda, salt, baking powder and cinnamon. 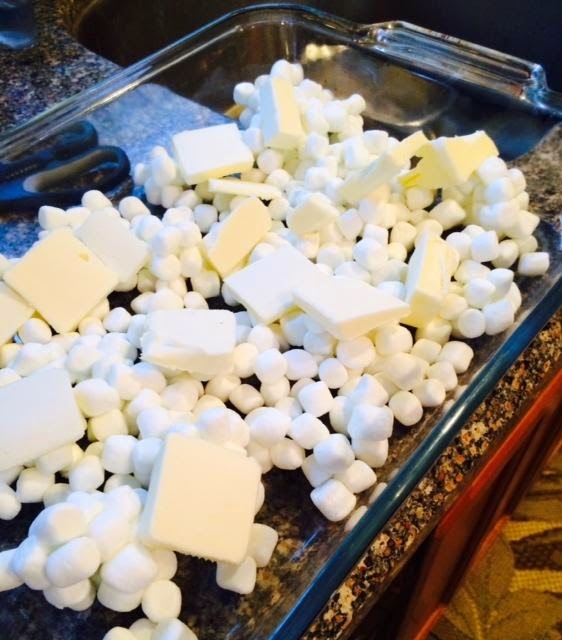 Add the cold, cubed butter and toss in the flour to help separate the cubes of butter. Using a pastry cutter, cut the butter into the flour until there are only a few pieces of butter that are the size of peas and the remaining mixture resembles coarse crumbs. Drizzle the buttermilk-egg mixture over the flour and fold with a rubber spatula to combine. The dough should not be completely incorporated and will look shaggy. If there is too much "dry flour" remaining, drizzle over another tablespoon - 2 tablespoon of buttermilk over the dry spots and combine again with a rubber spatula. Dump the dough onto a lightly floured cutting board, then pat into a rectangle about 1/2" thick. At this point, the dough should be holding together. Spoon the cooled apple mixture over one half of the dough in an even layer leaving a border around the edges. Then fold the other half of the dough over the apple mixture, pressing the edges to help seal in the apples. Cut into 12 equal pieces with a sharp knife and carefully transfer to the prepared baking sheet placing them about 2" apart since the scones will rise and spread a little. If the baking sheet seems too crowded, divide onto 2 baking sheets. Refrigerate for 15 minutes to help chill the dough. Don't skip this part. This ensures that the butter is cold when you bake the scones. While the scones are chilling, preheat your oven to 400f. After 15 minutes, remove the baking sheet from the fridge and brush the scones lightly with buttermilk, then sprinkle with cinnamon sugar mixture. Bake approx. 20 minutes or until light golden brown. Cool scones on the baking sheet for approx. 5 minutes, then transfer them to a wire cooling rack to cool. While the scones are cooling, make the glaze: Combine the powdered sugar, heavy cream and vanilla in a small bowl. Mix well to combine. Add water a little at a time, stirring well after each addition, until you reach your desired consistency. The glaze should still be slightly thick but should drizzle easily. 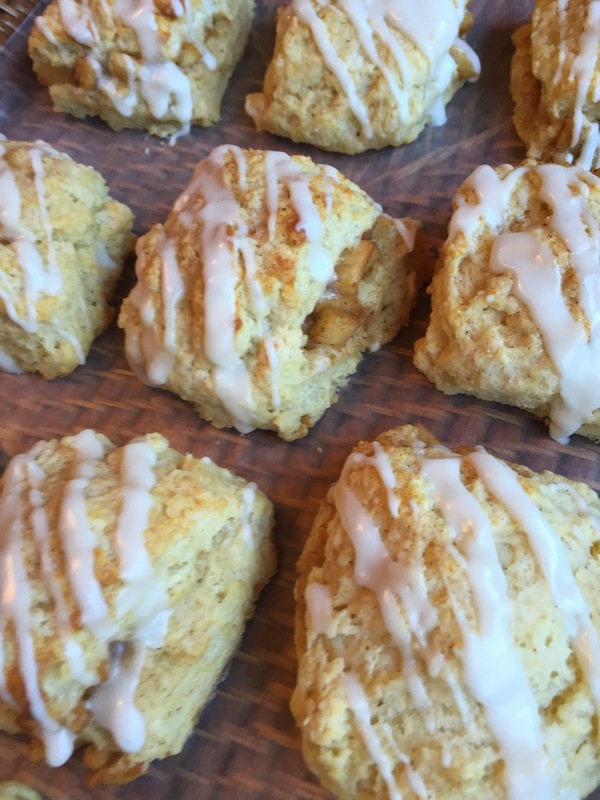 When scones have cooled, drizzle with the glaze and serve immediately or within a few hours. If you need to make the scones more than a few hours ahead of time, apply the glaze before serving. Store leftovers loosely covered at room temp for up to 1 day. For this month's Leftover's Club I was excited to be paired (for the second time) with Shaina from Take a Bite out of Boca. 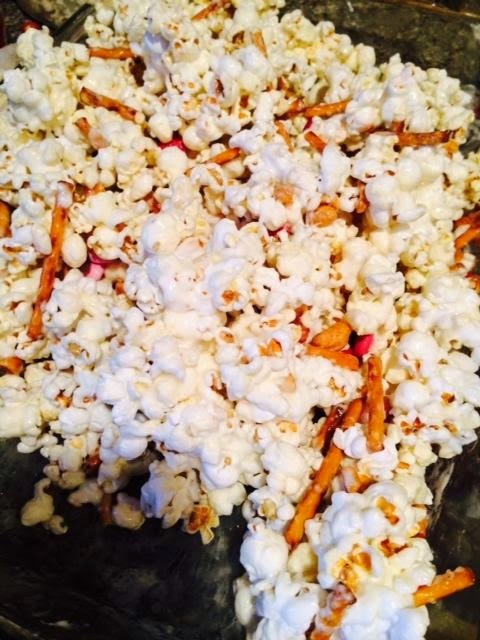 Shaina has a great blog with lots of recipes and restaurant reviews. Shaina and I have been in the Leftover's Club for quite a while and we both love it. Who wouldn't want to trade goodies each month with a fellow blogger? If this sounds like fun to you (and why wouldn't it? ), I encourage you to sign up at Food Ramblings! 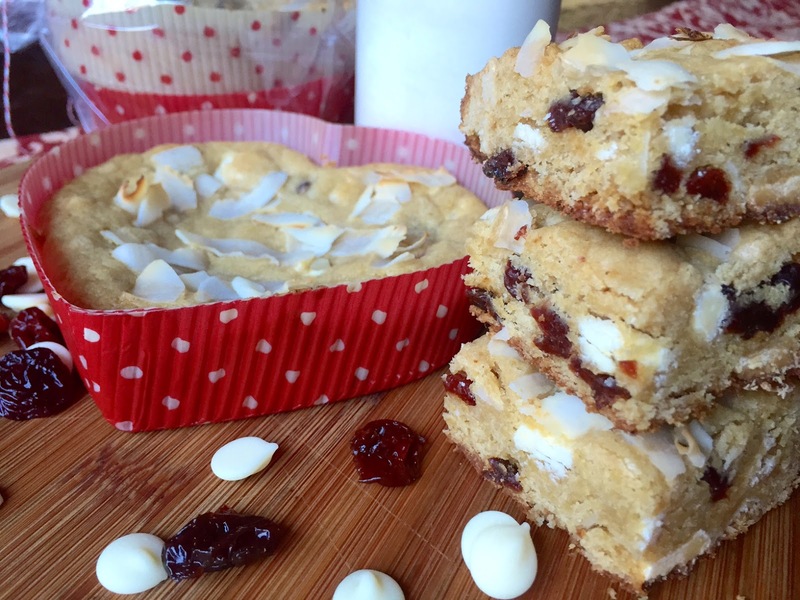 After reading through Shaina's Blog, I discovered she likes cherries so I decided to make these delicious White Chocolate Cherry Coconut Blondies. White chocolate on its own has a tendency to be pretty sweet so the tartness of the dried cherries really complimented the sweetness of the chocolate. The unsweetened flaked coconut really adds to the chewy texture. 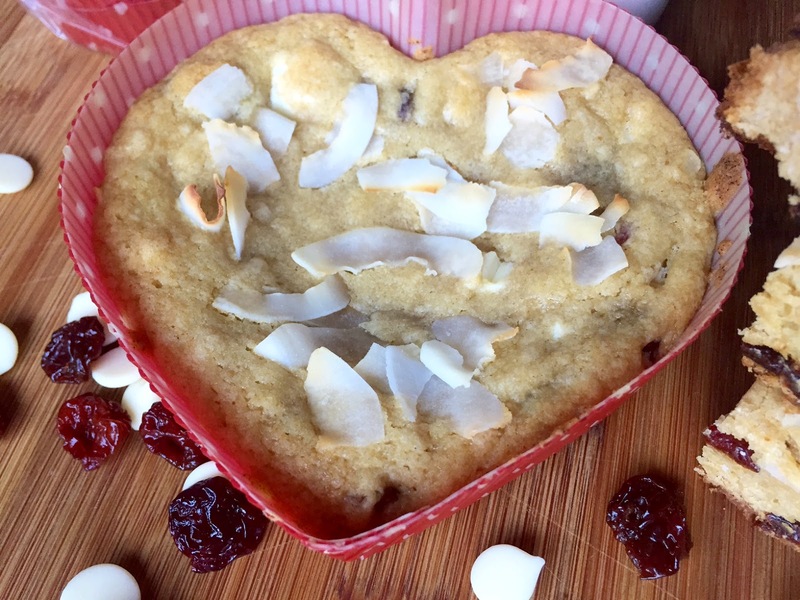 To me, these flavors are perfect for Valentine's Day so I decided to bake the blondies in the shape of a heart, cuz you know... hearts are just cute. I hope Shaina enjoys the blondies and I hope you give them a try too! Preheat oven to 350f. Line a 9"x13" baking pan with non-stick aluminum foil (or use regular foil sprayed with non-stick cooking spray). 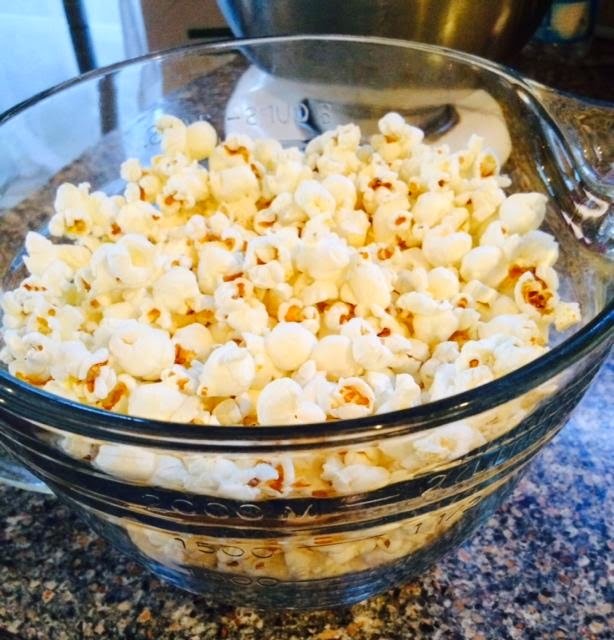 In a large bowl, whisk together the melted butter and light brown sugar until well combined and smooth. Add the eggs, one at a time, whisking well after each addition. Add the flour mixture and stir until combined. 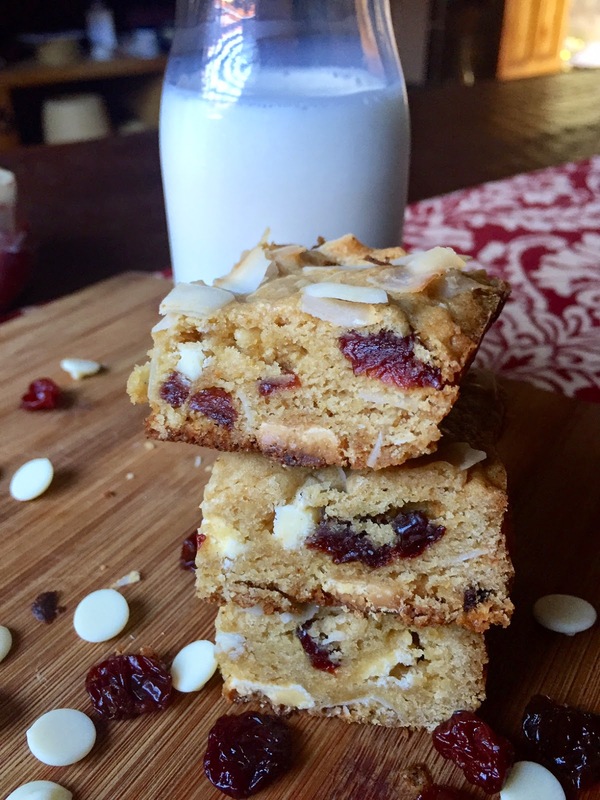 Using a rubber spatula, fold in the white chocolate chunks, cranberries and 1/2 cup for the coconut flakes. Dollop the dough into the prepared baking pan and spread into an even layer. Sprinkle with the remaining 1/2 cup of coconut flakes. Bake at 350 for approx. 25 minutes or until the bars are set and the edges and top are lightly golden brown. Remove and place on a wire cooling rack to cool. When bars have cooled, cut into squares. Store in an air-tight container at room temperature for up to 3 days.